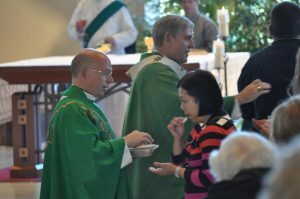 “How We Celebrate,” is the second section of the Catechism of the Catholic Church, and includes many teachings on how we worship — the liturgy, and the Eucharist, which is considered the source and summit of our Catholic faith. 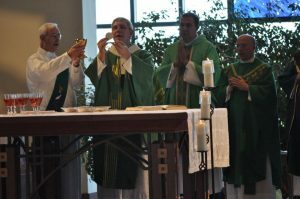 According to the CCC # 1073, “The liturgy is the summit toward which the activity of the Church is directed; it is also the font from which all her power flows.” As we continue with this blog series, LeAnn Rogan discusses the term, Transubstantiation, and what happens at Mass when bread and wine is consecrated. LeAnn, along with her husband, Mark, have been active parishioners and leaders at St. Anne since 1999. 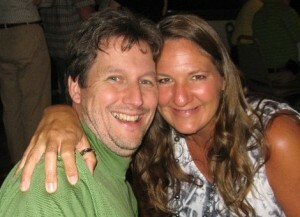 They reside in Racine, Wisc., with their two teenagers, McKenna and Adam. Transubstantiation –“ a 50 cent word” my Catholic gradeschool principal, Charlie Cooper, used to call it. This was a compliment to the word, of course, meaning it was worth more than the “two cents” adults would chime in when you hadn’t solicited them for advice, and worthy of our serious contemplation. Mr. Cooper was warning us that this was both a difficult word to spell and to understand. In eighth grade I admit I didn’t fully wrap my head and heart around it. I remember telling my mother as much and she just smiled and let me have my opinion cautioning me to patiently await some enlightenment later in life. It came! The scholastic term used to designate the unique change of the Eucharistic bread and wine into the Body and Blood of Christ. ‘Transubstantiation’ indicates that through the consecration of the bread and the wine there occurs the change of the entire substance of the bread into the substance of the Body of Christ, and of the entire substance of the wine into the Blood of Christ- even though the appearances or ‘species’ of bread and wine remain (1376). It was the work of the late Italian Sophia Cavaletti with pre-school-aged children that really drove home the meaning of Transubstantiation for me. Here’s a brief synopsis of what I’ve learned happens during the Consecration and Epiclesis at Mass, the time in which the priest raises his hands to Heaven where the Gift originates and the Church asks for the Holy Spirit’s power to hover over our earthly gifts of bread and wine changing them into the Body and Blood of Jesus Christ. like wine, and tastes like wine, it has been changed, in its essence, into JESUS! Wholely and truly Jesus! Miracles only happen where there is faith and only the faithful can see Jesus in the Holy Eucharist. What appears to be bread and wine is, in fact, a changed (trans) substance, not only made up of flour and water and grapes, but of Jesus’ own flesh and blood –not a symbol of His flesh and blood, but truly Jesus Himself come to be with us, in us, to change us, too! I want to be “transubstantiated”, a changed substance. Oh you’ll keep on seeing LeAnn, but at my essence I will be a new creation, a better me, wholely and truly a child of God in and of the Body of Christ. I don’t want to be a symbol of LeAnn; I want to be the best LeAnn I was made by God to be. 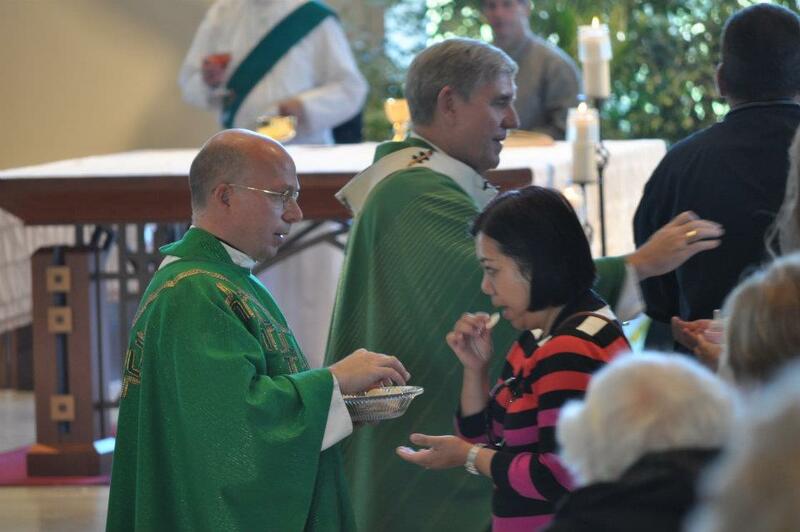 Receiving Holy Communion at Mass helps me to be mindful of this change I am seeking, strengthens me for the journey toward becoming my best self in Christ. Growing in our understanding of the tenets of our Catholic faith like Transubstantiation gives us the language, the vocabulary, to talk about what we believe. Talking about the truth of the Catholic faith can help it to grow in our own hearts even as those truths take root in new hearers of His word. Be the catalyst for someone new to hear a 50cent word. See you at Mass!